Every so often my father will forward me an email with a message like "Is this for you". He broadly assumes that any email relating to something he does not understand must be for me. I have explained to him that I have my own email. I generally know what to look out for when someone is trying to 'phish' me. That said, recently I have seen some more impressive attempts. Attempts that I am confident that someone less technical might fall for. Similarly I have received some less than good attempts, which I figured I would document. Recently I received this one from 'Netflix'. Initially I was confused. I don't use Netflix. I was even more confused. 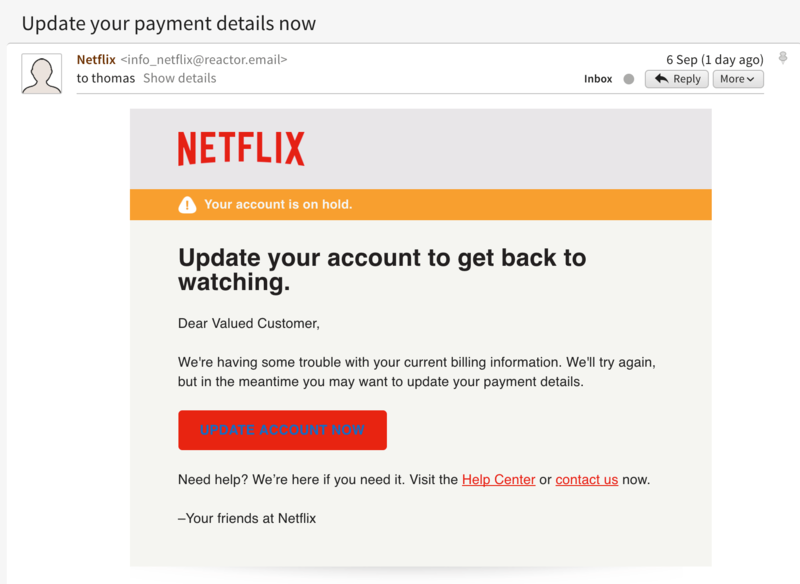 Why were 'Netflix' using 'info_netflix@reactor.email' to send their email? I opened the email. "Why is that button using such an obscene colour scheme" I thought. I had a look at the email headers. The phisher is using SES. Surely Amazon can track these people down..? Who is paying the bill..?